Although this website is focused on the LED grow light, it would not be complete without also looking at one of its close competitors, the CFL grow light. ​Nowadays you can get compact fluorescent lighting that can cover any part of the visible light spectrum and which is powerful enough to be used as a grow light. Like LED grow lights, CFL ​plant lights exhibit several advantages over the more traditional HID grow light. CFL grow lights are cheaper, and much more energy efficient, they don’t have to be actively cooled, they have an integrated ballast, and they are useful for use within small spaces, such as grow tents, ​since plants can grow quite close to them without suffering the negative effects of excessive heat. As you can see, many of these advantages are similar to those of LED grow lights. ​Unlike LED grow lights however, where you can identify the specific wavelengths of light being emitted, ​the CFL plant light emits over a wide range of colour wavelengths that combine together to produce a ‘shade’ of white light. Depending on their construction, different CFL grow bulbs will emit different colour ranges thereby producing different shades of white light. Due to this limited control over the exact wavelengths emitted from the grow light, a different scale called the Kelvin scale (K) is used to represent the type of CFL grow light. Lower Kelvin CFL bulbs used for growing will emit white light containing more red wavelengths of the visible light spectrum, so are generally used for flowering regimes, whereas higher Kelvin bulbs are associated with white light that contains more blue wavelengths, and so are often used for vegetative growth. ​​​So the first thing to consider when choosing your CFL grow light is whether you need it for vegetative growth or to encourage your plants into flowering and fruit production. If you want to avoid spending on two different types of CFL grow light, one for vegetative growth and one for flowering induction, dual spectrum CFL grow lights exist that have been configured to emit over both the red and blue ranges, essentially covering all parts of the visible light spectrum required by the plant life cycle. Remember though, with dual spectrum CFL grow lights you will be sacrificing a little on both optimal plant vegetative growth and flowering induction for the sake of economy, so it just depends on what is more of a priority ​in your particular circumstances. ​​Once you have decided on which colour temperature bulbs you are looking for, the next task to consider is the amount of lumens or light intensity you need in order to get optimal plant growth. The mid-summer sun produces approximately 100,000 lumens / ​m2 (≃10,000 lumens / ​ft2 if you are an American) on a perpendicular horizontal surface at sea level. Obviously the sun is not always unobstructed and exactly perpendicular to the surface of the earth, and in fact on an overcast day, this value can drop ​to as low as 10,000 lumens / m2 (1,000 lumens / ​ft2​). However, the sunny 100,000 lumens / m2​ value at least gives you an idea of what ‘perfect’ lighting conditions ​are like in nature, and so it makes a reasonable target to aim for in your grow area. It is well established that measuring lumen output (luminous flux) is not the best method to gauge how good lighting is for plants since ​plants mostly photosynthesise using the blue and red wavelengths at either end of the visible light spectrum, while lumen measurements are weighted more towards the central yellow-green wavelengths which plants do not use. In other words, a bulb may have a high lumen rating but then be emitting predominantly ​yellow-green ​light which would not be good for plant growth. Conversely, another light ​may have a lower lumen rating due to emitting almost no ​yellow-green ​wavelengths while providing more than enough red and blue ​light for plants to thrive. Today, the metric used to measure how good lighting is for growing is the amount of Photosynthetically Active Radiation or PAR which measures the amount of light that plants are able to use for photosynthesis from a light source. Unfortunately, when it comes to CFL grow lighting, PAR measurements and ratings are in short supply, and trying to buy a CFL grow light based on its PAR rating is practically impossible. Instead CFL grow lighting continues to be rated in lumens for brightness and Kelvin for its emission spectrum. Fortunately however, by choosing a CFL light that is designed for growing ie. its emission spectrum has been ​optimised to either the red or the blue (or both in the case of dual spectrum) ends of the visible light spectrum, one can ​​assume that the lumen rating for a CFL ​plant light will be measuring predominantly photosynthetically active radiation. ​Furthermore as a rough guide to keep calculations simple, the ​percentage of non-PAR light that does off a CFL bulb ​can be considered to ​roughly match the ​proportion of non-PAR light coming off the sun, since it too emits yellow-green light wavelengths. This ultimately means that ​the 100,000 lumens / ​m2 ​value discussed earlier is a reasonable target to aim for if we want full direct sun equivalent conditions in our grow area. ​The 125W CFL grow bulb puts out approximately 7000 lumens of light and is sufficient for a very small grow area. Our ​hypothetical target brightness is 100,000 lumens pers square ​metre ​​for an equivalent of a continuously sunny day, ​therefore 7000 lumens would ​be 'perfect' for a 27cm x 27cm grow area. Of course, a larger area would still be fine but not necessarily absolutely optimal for plant growth. ​We​ did a short test of a 125W CFL bulb on a small grow area pitting it against a 90W LED grow light ​in an equivalent setup and found ​both lights gave almost identical results. 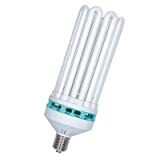 ​The 200W CFL grow bulb emits light at approximately 12,000 lumens. This would ​be enough for ​our ideal 'full sun' equivalent lumen target ​on an area of 0.12 ​m2​ (35cm x 35cm) and cover a yet larger area with reasonable but suboptimal ​lighting. ​​A 250W CFL bulb will emit light at about 15,000 lumens which should cover an area of ​0.15 m2​ with ​maximal lighting conditions, which is equivalent to an area of 39cm x 39cm. Once again, this target represents ​the maximal lighting ​intensity in nature which typically does not occur on a continuous basis, so using a 250W CFL light on a moderately larger area ​should work fine too​. ​300W CFL bulbs emit ​around 18,000 lumens of light so each bulb is ideal for a grow area of about ​0.18 m2​ for strong sun-equivalent conditions, which is equivalent to an area of 42cm x 42cm. If you have a 1 square metre grow area, in a perfect world, you would need 5 of these goliaths to hit our full sunlight target of 100,000 lumens per ​m2. ​​That seems like a lot of ​CFL bulbs for a relatively small growing area but remember that this is for hitting a target equivalent to perfect sunny conditions for the whole day, each and every day! How many times (especially here in the UK!) have you seen the sun come out and stay out each and every day, and fix itself permanently at the highest point in the sky? You haven't. The point is that plants will grow well with a lot less lumens than our target, so lower numbers of ​CFL grow bulbs will work well too - our target provides a good point of reference though. CFL grow lights are giants in size in the world of compact fluorescent lighting, but they can still be used in the standard E40 (40mm Edison Screw) ceramic grow light holder that one usually uses for HID lamps (obviously without connecting the HID ballast!). If you don't already have the fitting, the CFL grow light is also often available together with the E40 lamp holder and reflector as a complete unit.